Studies show that travel can make you smarter and healthier.You’re going to need a few target destinations to lead your adventure. Don’t worry, we’ve got you covered. When on a journey to travel the globe, make sure each of these 25 amazing places to visit before you die are on the itinerary. 1. The Great Barrier Reef, Queensland, Australia The Great Barrier Reef is the largest collection of coral reefs in the world, spanning over 1,400 miles. It’s so large that it can be seen from space, and it’s among one of the Seven Wonders of the Natural World. It is the place to go diving, offering a one-of-a-kind display of underwater life. 2. Pyramids of Giza, Egypt As the only one of the Seven Ancient Wonders of the World still largely intact, the Pyramids of Giza are definitely worth a visit. Dating back to around 2,560 BC, the Great Pyramid of Giza stood as the tallest man-made structure for over 3,800 years. 4. Salar De Uyuni, Bolivia This massive salt flat–the largest in the world–spans a massive 4,086 square miles. Formed by several ancient lakes, this salt flat becomes so reflective in the rainy season that it’s used to calibrate satellites. It’s effectively the world’s largest mirror and a breathtaking sight. 5. The Grand Canyon, Arizona, USA Carved over thousands of years by the Colorado River, the Grand Canyon is a sight to behold that one simply can’t fathom without being there. The massive rock walls span for over 200 miles. 7. Easter Island, Rapa Nui, Chile Like Stonehenge, no one really knows the story behind the 887 Easter Island “moai” statues. Even so, they offer visitors a great adventure. Plus, travelers can enjoy other Easter Island adventure options, like hiking and scuba diving. 8. Reed Flute Caves, China Today, the Reed Flute Caves are highlighted by multicolored lights, turning the 240-meter-long cave system into a stunning experience. As one of China’s most popular attractions for over 1,200 years, it’s worth the visit to view these incredible stalactite, stalagmite, and pillar formations. 9. The Great Wall of China, China This massive, man-made wall stretches thousands of miles long. Not only does the marvelous structure leave many visitors scrambling to pick up their jaws knowing it was made by human hands, but it’s atop a mountain ridge that delivers awe-inspiring views of the area. 12. 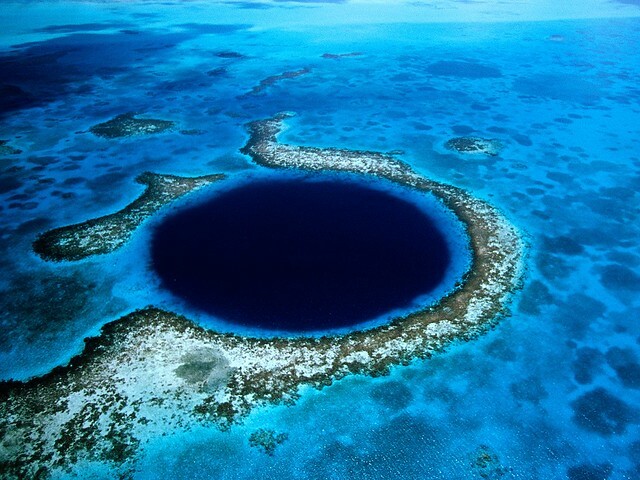 The Great Blue Hole, Belize Off the coast of Belize, divers find a submarine sinkhole called The Great Blue Hole, where the water is 407 feet deep. It’s over 980 feet wide and can easily be seen from above. 15. Bora Bora, French Polynesia Bora Bora is the poster child of the iconic tropical paradise. This island sits 143 miles northwest of Papeete, in the South Pacific, and features the extraordinary turquoise waters, white sand beaches, and beautiful greenery you’d hope to find in the tropics–only it’s more fantastic than you can imagine. 16. Taj Mahal, Agra, Uttar Pradesh, India The Taj Mahal is a truly beautiful architectural feat. It’s a massive, white, marble-domed mausoleum constructed in the 1600s that attracts over three million visitors each year. 17. Tianzi Mountains, China Set as the inspiration for the floating mountains in the movie Avatar, these formations are more breathtaking than you can imagine. The area spans 16,550 acres, and the tallest peak rises about 4,140 feet above sea level. 18. Angkor Wat, Cambodia Angkor Wat was previously a Hindu and Buddhist temple built in the 12th century. Today, it’s an architectural wonder worth visiting. 20. Glacier National Park, Montana, USA Glacier National Park offers some of the most stunning scenes in the US. It’s full of beautiful mountains, green alpine forests, and clear lakes. There are over 700 miles of trails, making it a hiker’s paradise. 21. Pamukkale, Turkey This area is home to natural hot springs that leave travelers in awe. Don’t end your journey without bathing in one of the remarkable natural tubs. 22. Victoria Falls, Livingstone, Zambia Are you ready to be impressed? You will be when you visit Victoria Falls. This waterfall measures one mile across and is 354 feet high. That–along with the fact that more than 260,000 gallons of water flow over the edge per second–makes it the largest singular waterfall in the world. 23. Venice, Italy Venice is the perfect destination for travelers seeking a unique city experience. The canals that run through the city act as roadways, providing a unique transportation option while delivering a beautiful scene. 24. Lençóis Maranhenses, Brazil This area features a collection of clean, white sand dunes intertwined with crystal clear blue waters, creating the kind of picturesque beauty you’d hope for–but rarely see–in a beach. 25. Highlands, Iceland A dazzling Northern Lights show is something that should be on every bucket list, and one of the best places to see the show is in Iceland’s highlands.